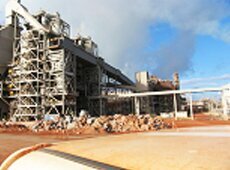 The Project was Blue Circle Southern Cement’s planned shutdown of their No 6 Cement Kiln to facilitate major remediation work through Jan / Feb 2009. 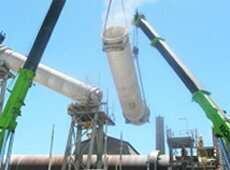 IES is a preferred service provider to Boral. Following an extensive cost estimating procedure the company was awarded three major components of the shutdown, each of which involved work at above 50 metres. December- IES established on site with remote area workshop and storage facilities. Pre-shutdown work was performed to assist in an efficient project start date. This included hot work and drop zone area delineation, temporary supports and reduce bolting. (IES time/phase plan assigns resources and supervision for the duration of the project). January- Schedule driven shutdown commences IES successfully relocated the 350 tonne Kiln No 6 Firing Hood, which had been pushed out of alignment, back to its original position using hydraulic jacking and an innovative ball bearing skate technique. IES removed and replaced the worn 80 tonne segment of tertiary air duct c/w renewal of three 2880mm diameter expansion joints. This was accomplished using a lift study and carefully co-ordinated dual 300 tonne crane lifts. IES removed and replaced worn shell segments in the No 1 Conditioning tower at 65 metres, directly above other work groups. 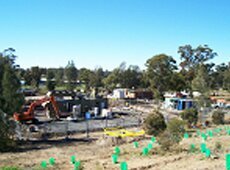 This project was an integral part of the Qld Government Western Corridor Recycled Water Project (WCRWP). 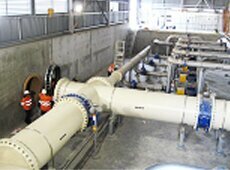 To supplement Swanbank Power Station cooling process water utilising purified recycled water. Designed from 5 global locations including USA, UK, Singapore, India and Hong Kong. 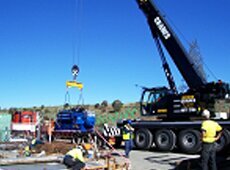 Delivered through the Thiess/Black & Veatch joint venture. 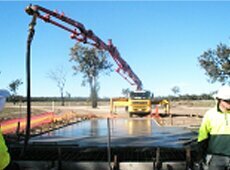 August 07- Commenced delivery of water to Swanbank. 5500 tonnes of steel installed. 28000 cubic metres of concrete poured. Zero LTI and 1 million hours worked. Construction of the chemical dosing facility tank farm. 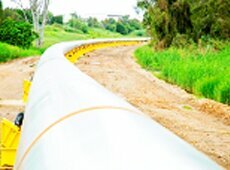 Install tanks and process piping. 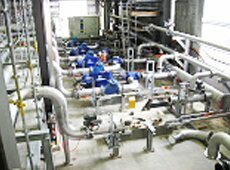 Installation Water Reclamation Process equipment. Install skids, S/S piping and valves for the Continuous Micro-Filtration (CMF). 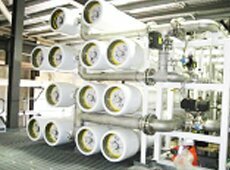 Install skids, piping and valves to make up the reverse osmosis process train. Swanbank delivery pipeline (Critical Path). UG piping c/w cathode protection and exposed surface corrosion protection. 2004- Market value of Aluminium is in excess of $ 400US/ tonne. Increased throughput required from existing facilities to meet global demand. 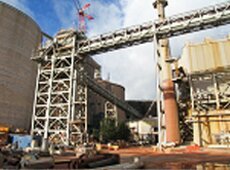 Alcan commits to $2 billion upgrade of existing facilities at its Gove refinery to increase throughput by 81%, from 2-3.8Mtpa. 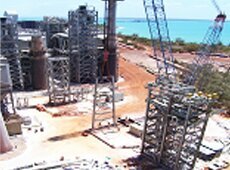 3rd Quarter 2006-IES is Sub-contracted to Thiess to perform a high risk component of the work in the Alumina handling process. Divorcing and diverting the existing process train of air transfer slides and directional chutes to facilitate construction access. Continued employment of a 250 tonne crane, using 56 metres of boom and 38 metres of luffing jib for 360 degree access around the tower. Constructing new dual Alesa Blower station complete with clean air filter room and attenuators. 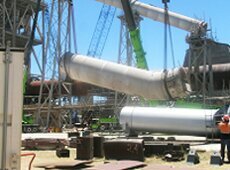 Constructing a new elevator vessel and installing with associated air slide conveyors at 65 metres. Drill and fix pipe anchors to the external concrete face of the existing 80 metre elevator tower. 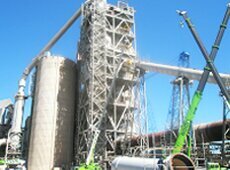 Install new 140 metres of elevator and de-dust piping onto the external tower face. Demolish and re-instate 112 metres vertical large elevator and de-dust piping internal to the tower. 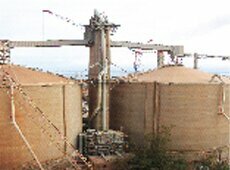 Integrate new equipment with existing Brownfield plant. Liaison with council and regulatory bodies, specifically regarding environment impact of the project. Liaison with electrical and telecommunications service providers. Procurement and logistics of all components to site. Surveying and bulk earth works. 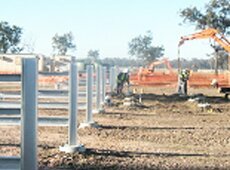 Civil and concrete equipment plinth construction incorporating full site earth grid installation. HV and LV cable installation utilising EXE/ EXD rated consumables and termination techniques. Careful excavation of, and ‘live’ tapping into the existing underground methane fuel header. Refurbishing existing customer equipment to relative exe/exd standards e.g. Generator enclosure, radiator pack and fans and attenuators. Installation of fuel gas heat exchanger unit. 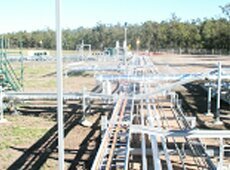 Manufacture and installation of fuel rail piping, surface preparation and treatment with regulatory colour and identification. 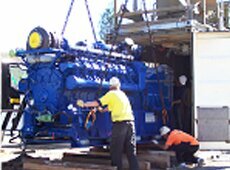 Installation of generator module and internal regulating valves and associated vibration eliminators. One of three major infrastructure projects delivered by SRWP. Link Water-State Government Project Owners. KBR, Abigroup and McConnell Dowell. 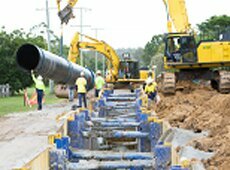 94 Km of predominantly underground large diameter mild steel, concrete lined (MSCL) piping from West Brisbane to Gold Coast. Capacity to transport 130ML per day of potable water. 832 workforce and staff employed at peak. 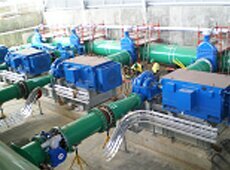 August 07- Following successful completion of the Chambers Flat pumping station, IES were given two more major components of the work. 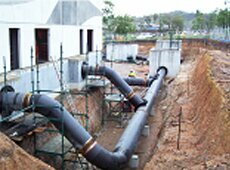 Upper Coomera Pumping Station and underground piping. Molendinar Pumping Station and underground piping. 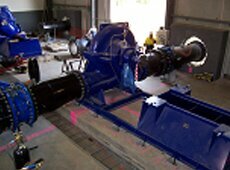 Complete mechanical packages for both assister pump stations. 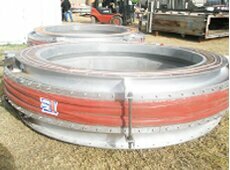 Large bore MSCL pipe fabrication and welding. Bell and spigot O ring joint. Welded and flanged bolt joint. 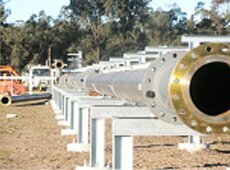 Carbon Energy has developed the world’s first commercial scale, oxygen-injected Underground Coal Gasification (UCG) facility, based at Bloodwood Creek in South West Queensland. May - IES wins the complete civil, mechanical and electrical scope of works to construct the 100 day trial plant. June -Under a sub-contract agreement, IES commenced construction of a remote accommodation camp with simultaneous survey and bulk earth works on site. July - Directional drilling commenced. This component of the works was entrusted to Mitchell Drilling Corporation. Hazardous areas are classified in accordance with AS2430 and control measures are set in place to continue work. a hazardous area commenced cable pulling and installation of the Gas Chromatograph. September - IES installed approx 2000 metres of carbon and S/S process piping of varying diameters Certified electrical personnel terminated approx 100 exe cable glands onto equipment. October - IES construction/commissioning phases overlap in order to accelerate the ‘burn day’ schedule. 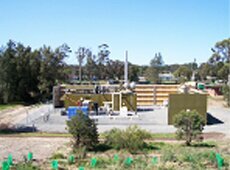 Nov- Synthesised gas is produced and 100 day trial commences.